Edward the Confessor[a] (Old English: Ēadƿeard Andettere [æːɑdwæɑrˠd ɑndetere]; Latin: Eduardus Confessor [ɛ.dʊˈar.dʊs kɔ̃ˈfɛs.sɔr]; c. 1003 – 5 January 1066), also known as Saint Edward the Confessor, was among the last Anglo-Saxon kings of England. Usually considered the last king of the House of Wessex, he ruled from 1042 to 1066. 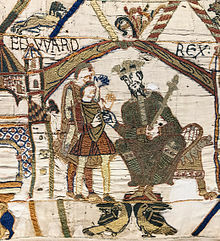 Edward was the son of Æthelred the Unready and Emma of Normandy. He succeeded Cnut the Great's son – and his own half brother – Harthacnut. He restored the rule of the House of Wessex after the period of Danish rule since Cnut (better known as Canute) conquered England in 1016. When Edward died in 1066, he was succeeded by Harold Godwinson, who was defeated and killed in the same year by the Normans under William the Conqueror at the Battle of Hastings. Edgar the Ætheling, who was of the House of Wessex, was proclaimed king after the Battle of Hastings in 1066, but never ruled and was deposed after about eight weeks. 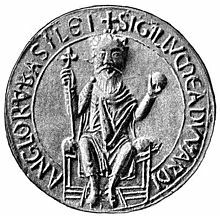 Cnut died in 1035, and Harthacnut succeeded him as king of Denmark. It is unclear whether he intended to keep England as well, but he was too busy defending his position in Denmark to come to England to assert his claim to the throne. It was therefore decided that his elder half-brother Harold Harefoot should act as regent, while Emma held Wessex on Harthacnut's behalf. In 1036 Edward and his brother Alfred separately came to England. Emma later claimed that they came in response to a letter forged by Harold inviting them to visit her, but historians believe that she probably did invite them in an effort to counter Harold's growing popularity. Alfred was captured by Godwin, Earl of Wessex who turned him over to Harold Harefoot. He had Alfred blinded by forcing red-hot pokers into his eyes to make him unsuitable for kingship, and Alfred died soon after as a result of his wounds. The murder is thought to be the source of much of Edward's later hatred for the Earl and one of the primary reasons for Godwin's banishment in autumn 1051. Edward is said to have fought a successful skirmish near Southampton, and then retreated back to Normandy. [b] He thus showed his prudence, but he had some reputation as a soldier in Normandy and Scandinavia. The left panel of the Wilton Diptych, where Edward (centre), with Edmund the Martyr (left) and John the Baptist, are depicted presenting Richard II to the Virgin Mary and Christ Child. The shrine of Saint Edward the Confessor in Westminster Abbey remains where it was after the final translation of his body to a chapel east of the sanctuary on 13 October 1269 by Henry III. The day of his translation, 13 October (his first translation had also been on that date in 1163), is regarded as his feast day, and each October the Abbey holds a week of festivities and prayer in his honour. 13 October is an optional feast day in the Catholic Church of England and Wales, and the Church of England's calendar of saints designates it as a Lesser Festival. Edward is also regarded as a patron saint of difficult marriages. For some time the Abbey had claimed that it possessed a set of coronation regalia that Edward had left for use in all future coronations. Following Edward's canonisation, these were regarded as holy relics, and thereafter they were used at all English coronations from the 13th century until the destruction of the regalia by Oliver Cromwell in 1649. 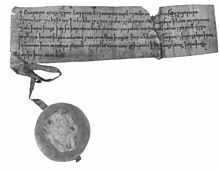 ^ The regnal numbering of English monarchs starts after the Norman conquest, which is why Edward the Confessor, who was the third King Edward, is not referred to as Edward III. ^ Historians' views are discussed in Stephen Baxter, 'Edward the Confessor and the Succession Question', pp. 77–118, in Mortimer ed., Edward the Confessor, which this section is based on. ^ a b c d e f g h i j k l m n o p q r s t u Barlow, Frank (2004). "Edward (St Edward; known as Edward the Confessor)". Oxford Dictionary of National Biography. ^ Rex, Peter (2008). King and Saint: The Life of Edward the Confessor, The History Press, p. 224. ^ Simon Keynes, 'Edward the Ætheling', in Mortimer ed., Edward the Confessor, p. 49. ^ Keynes, op. cit., p. 56 n.
^ James Panton (24 February 2011). Historical Dictionary of the British Monarchy. Scarecrow Press. p. 21. ISBN 978-0-8108-7497-8. ^ Elisabeth van Houts, 'Edward and Normandy', in Mortimer ed., pp. 63–75. ^ a b Howarth, David (1981). 1066: The Year of the Conquest. Harmondsworth, UK: Penguin. ISBN 0-14-005850-8. ^ a b Lawson, M. K. "Harthcnut" Oxford Dictionary of National Biography, 2004. ^ Anglo-Saxon Chronicle (MS E) s.a. 1041 (1042), tr. Michael Swanton. ^ Barlow, op. cit., p. 61. ^ Van Houts, p. 69. Richard Gem, 'Craftsmen and Administrators in the Building of the Abbey', p. 171. Both in Mortimer ed., Edward the Confessor. Robert of Jumièges is usually described as Norman, but his origin is unknown, possibly Frankish (Van Houts, p. 70). ^ Williams, Ann "Edith (d.1075)" Oxford Dictionary of National Biography, 2004. ^ Williams, Ann "Ralph the Timid" Oxford Dictionary of National Biography, 2004. However, Frank Barlow in his DNB article on Edward, states that Ralph received Hereford on Sweyn's first expulsion in 1047. ^ Barrow, G. W. S. "Malcolm III" Oxford Dictionary of National Biography, 2008. ^ Walker, David. "Gruffydd ap Llywelyn" Oxford Dictionary of National Biography, 2004. ^ Williams, Ann. "Ælfgar" Oxford Dictionary of National Biography, 2004. ^ Aird, William M. "Tostig" Oxford Dictionary of National Biography, 2004. ^ a b "Abbey History". Westminster Abbey. Retrieved 5 November 2016. ^ Hooper, Nicholas. "Edgar Ætheling" Oxford Dictionary of National Biography, 2004. ^ Blair, John. "Spearhafoc" Oxford Dictionary of National Biography, 2004. ^ Cowdrey, H. E. J. "Stigand" Oxford Dictionary of National Biography, 2004. ^ a b Barlow, Frank. "Osbert of Clare" Oxford Dictionary of National Biography, 2004. ^ Summerson, Henry. "Saint George" Oxford Dictionary of National Biography 2004. ^ "Saint Edward the Confessor". Saints.SQPN.com. 5 April 2013. Accessed 5 August 2013. ^ Keay, A. (2002). The Crown Jewels. London: The Historic Royal Palaces. ISBN 1-873993-20-X. ^ Barlow, Frank (ed. and trans.). The Life of King Edward Who Rests at Westminster (Vita Ædwardi Regis), Oxford University Press, 2nd ed. 1992, p. 19. ^ "England, Anglo-Saxon, and Danish Kings". Foundation for Medieval Genealogy. 25 April 2017. Retrieved 1 April 2018.